Exactly last week, I started my annual leave. In fact, I've got the time to blog today is all because I'm still on leave. *LoL* Well, I've actually a lot to tell but I simply don't know how to put it properly without stumbling on my words here and there. So, I've decided to tell it all slow lil by lil as the memories of the past 6 days start coming back to me. Indeed, the solo trip to Hanoi has been an enriching one. I would not say it was a relaxing one but it's one that has raised my self confidence by leaps. I can actually do a trip by myself! Yay! I've actually made it! That's the trip of the year that's I've been planning since the flight bookings in February and the uncertainties before it really came true. 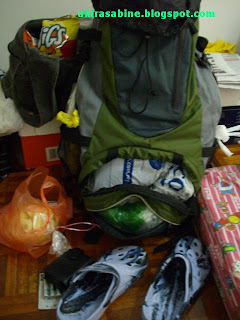 At some points before the trip, I even doubt my ability to do it, half due to discouragement from my parents. Can't really blame them as which parents wouldn't worry especially travelling solo to a 3rd world country with traffic as crazy as in Vietnam. On the other hand, my work training which claimed to be starting in early July did affect my plans to the extend that I only booked my stays at last minutes. So, exactly last Fri, there you go, some food stuffs, new pair of footwear (an easy slip-in and out, fast drying and most importantly light good walking sandals), camera+charger, rechargeable batts, etc etc. 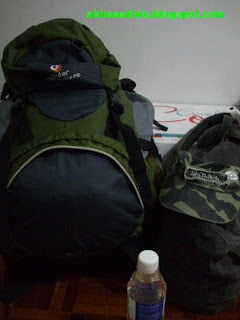 There you go, a backpack and a sling bag ready for tomorrow's departure to Hanoi for 6D/5N. Ciao, bedtime. So, I went to bed.. could hardly get a good sleep before my alarm rang and I woked at 2.30 am. Prepped and set off to KL Sentral for the 3.30 am ride.